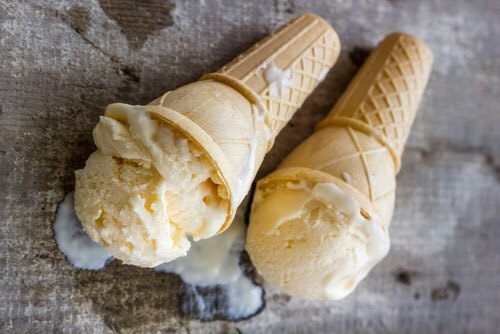 You'll enjoy trying these lemon ice cream recipes from Grandma's collection. 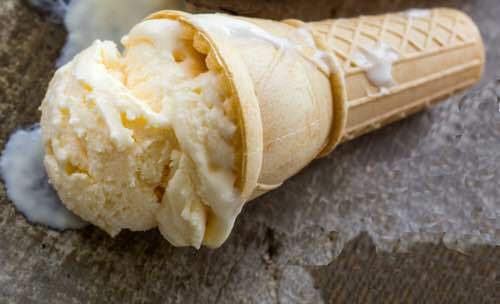 One of the first ice cream flavors to be invented was all-natural lemon, and it has remained popular for many generations. The fresh, zesty taste of lemon in these creamy homemade ice creams cannot be duplicated by store-bought brands. You need to taste the refreshing difference yourself to truly appreciate it. I especially like it when tiny bits of lemon zest are added to the frozen mixture. So fresh and natural. It's so delicious! To one quart of cream use the yolks of three eggs. Put the cream over the fire till it boils, during which time the eggs are beaten up with half a pound of white sugar, powdered fine; and when the cream boils, stir it upon the eggs and sugar, then let it stand till quite cold, then add the juice of three or four lemons. It is then ready to put into the freezer. The heat of the cream partially cooks the eggs, and the stirring must be continued to prevent their cooking too much. To half a pound of powdered sugar, add the juice of three lemons. Mix the sugar and lemon together, and then add one quart of cream. This is less rich and delicate than the preceding recipe, but is quite rich enough for common use, and some trouble and time is saved. One quart of milk. One and a half tablespoonfuls of arrowroot. The grated peel of two lemons. One quart of thick cream. Wet the arrowroot with a little cold milk, and add it to the quart of milk when boiling hot; sweeten it very sweet with white sugar, put in the grated lemon peel, boil the whole, and strain it into the quart of cream. When partly frozen, add the juice of the two lemons. Twice this quantity is enough for thirty-five persons. Find the quantity of sugar that suits you by measure, and then you can use this every time, without tasting. Some add whites of eggs; others think it just as good without. It must be made very sweet, as it loses much by freezing. 1 quart of cream. 2 lemons — the juice of one and the grated peel of one and a half. 2 cups of sugar. Sweeten the cream, beat the lemon gradually into it, and put at once into the freezer. Freeze rapidly in a patent freezer, or the acid is apt to turn the milk. You may make orange ice cream in the same way. Grate the peel of two lemons into a pound of pulverized sugar; put the sugar into a quart of cream and boil; beat the yolks of eight eggs light, and add gradually to the boiling cream, and let it boil up once more. Remove from the fire and stir until cold, then stir the juice of three lemons into the cream; do this rapidly and turn into the freezer at once and freeze, for the acid is apt to turn the cream sour. Note: An orange ice cream is made in the same way by omitting the lemons in favor of oranges.